Frequently Asked Questions put to Parliament's Spokesperson’s Department > Current page:: Who are the MEPs in key functions and how are they elected? 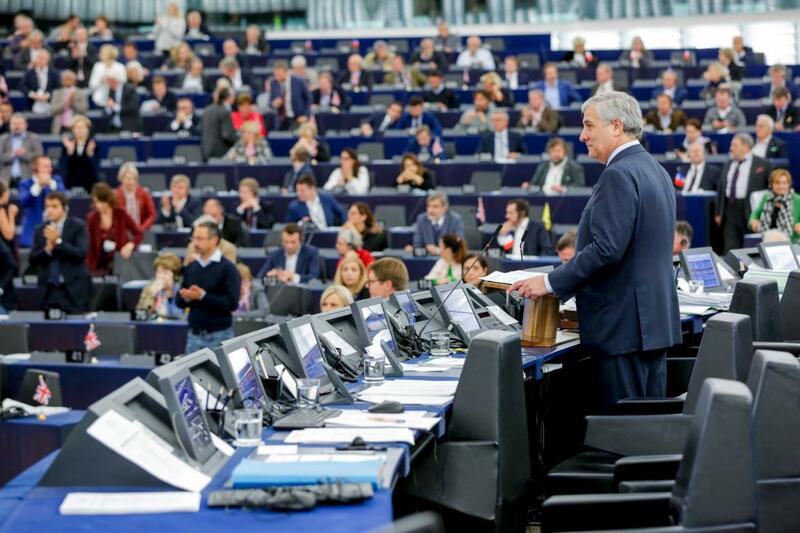 At the first plenary session after the European elections, Parliament elects a new President, 14 new Vice-Presidents and five Quaestors. All elected offices in the European Parliament, i.e. President, Vice-President, Quaestor, Committee Chair and Vice-Chair, and Delegation Chair and Vice-Chair, are renewed every two and half years, so once at the start and once half-way through the 5-year legislative term. Current office-holders can be confirmed for a second mandate. In electing the President, Vice-Presidents and Quaestors, account should be taken of the need to ensure an overall fair representation of member states and political views. The President directs Parliament's activities, chairs plenary sittings and signs off the annual EU budget. The President represents the Parliament to the outside world and in its relations with the other EU institutions. In January 2017 Antonio TAJANI was elected European Parliament President. How is she or he elected? The first act of a new European Parliament is to elect its President. Candidates for the Presidency may be proposed either by a political group or by a minimum of forty MEPs . The election is held by secret ballot. To be elected, a candidate must win an absolute majority of the valid votes cast, i.e. 50% plus one. Who are the Vice-Presidents and Quaestors? Vice-Presidents may replace the President in performing his or her duties when necessary, including chairing plenary sittings. They are also members of the Bureau - the body responsible for all administrative, staff and organizational matters in Parliament. The Quaestors deal with administrative matters directly affecting MEPs themselves. The European Parliament has 14 vice-presidents and five quaestors. Candidates for the posts of Vice-President and Quaestor may be presented either by a political group or by at least 40 Members. The vice-presidential election is held using a single secret ballot on all candidates. The order in which candidates are elected determines the order of precedence). Who are the political group chairs and how are they elected? There are currently 8 political groups in the European Parliament. Each political group elects its own chair or chairs. The chairs and the EP president constitute the EP Conference of Presidents. The Conference of Presidents organizes Parliament’s business and legislative planning, decides the responsibilities and membership of committees and delegations and is responsible for relations with other EU institutions, the national parliaments and non-EU countries. Who are the committee chairs and how are they elected? During their constitutive sittings (and mid-term, when new office-holders are elected), Parliament's committees elect their Chairs and Vice-Chairs. Chairs and Vice-Chairs may also be confirmed for a second mandate in the elections taking place in the mid-term of the legislature. Each committee elects its Bureau, consisting of a Chair and of Vice-Chairs, in separate ballots. The number of Vice-Chairs to be elected is determined by the full Parliament upon a proposal by the Conference of Presidents. Parliament’s standing interparliamentary delegations (for relations with non-EU parliaments) also elect their Chairs and Vice-Chairs, using the same procedure as for committees. Who are the Coordinators in committees and how are they elected? The political groups elect “coordinators” for the parliamentary committees. They are each group’s political leader in the committee. They coordinate their group’s viewpoint on the topics before the committee, and together with the chair and the vice-chairs, they organise the work in the committee.